Young’s Gym is the premier gymnastics and cheerleading facility in the Wake Forest and surrounding areas! We offer a variety of programs: Preschool/Recreational gymnastics, Competitive All-Star cheerleading teams, Track-Out day camps, Birthday Parties, Tumbling Classes, Parent’s Night Outs, Summer Camps, and other fun activities! The Young’s Gym app allows you to register for classes, parties, and special events! - Have a class in mind? Search by program, level, day, and time. 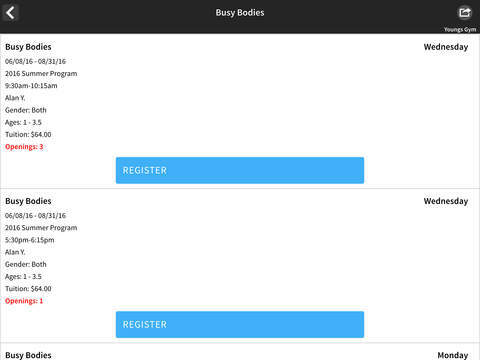 You can register right within the app. - Quick and easy access to register for all of our fun activities including camps, birthday parties, parent night outs. - Need to know if classes are cancelled due to holidays? The Young’s Gym app will be the first to let you know. 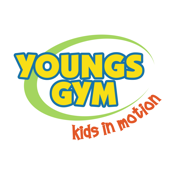 The Young’s Gym app is an easy-to-use, on-the-go way to access everything Young’s has to offer right from your smartphone.